What Happened to the New Poor Peoples’ Campaign? New Orleans We are in the thick of the forty days of week by week protests called to take place around the country by the Poor Peoples’ Campaign: A Call for Moral Revival. After huge pre-campaign publicity that included a lengthy profile of the campaign’s leader, North Carolina’s Rev. William Barber, in The New Yorker and other national papers and publications, now the silence is deafening. There has been virtually no national press that I have seen on the effectiveness or even the existence of the protests on various themes. The campaign’s own website seems to prove this as well with no postings of articles on its “press” section since the campaign began. What’s happening? Local 100 United Labor Unions is a member of the campaign in Little Rock, but there’s no evidence of the current campaign in New Orleans, Houston, or Dallas where we also have offices. 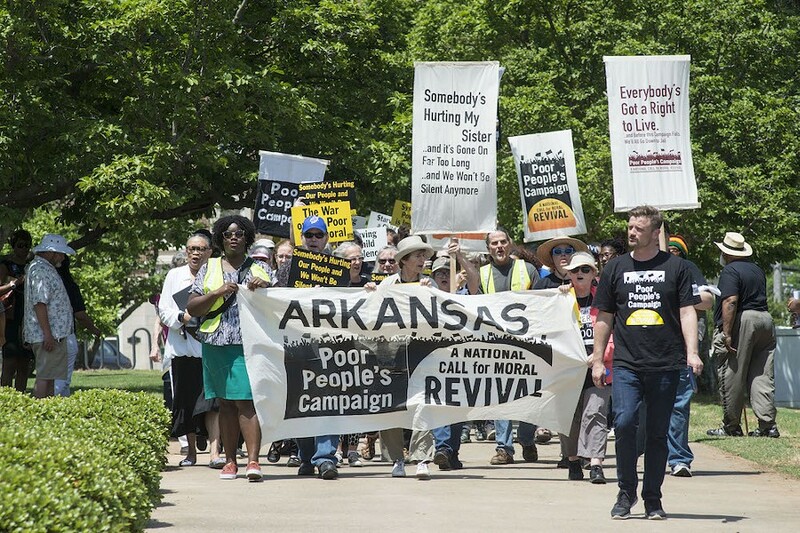 The Little Rock protests, joined by the union and our ally, the Arkansas Community Organizations (ACO), formerly Arkansas ACORN, have been reported locally. They have been regular and feisty with occasional arrests for civil disobedience of several people, but they have been smallish with often only twenty or so participants. Large rallies in Washington, D.C. are heralded on the campaign’s website for later in June, so the energy and emphasis for the campaign may be going towards those events, but the lack of action in many cities is worrisome, especially since the list of partners was extensive, including a number of large labor unions and religious denominations. Normally, that level of support would have translated into a more recognizable local footprint for the campaign, but tellingly, none of the national church-based community organizing networks Faith in Action, Gamaliel, DARE, or the IAF are listed as campaign partners. What are we to conclude at the midpoint of what we would have hoped indicated a resurgence of interest in and activity by the poor? It seems clear that people so far just aren’t answering the “call for moral revival.” They are voting with their feet and their bottoms are staying in their chairs. People are moving around politics everywhere, but that has not translated to the campaign. In fact, the almost apolitical nature of the campaign and its focus on a moral awakening, rather than empowerment has been one of the continual, but quiet criticisms. In fairness, it is hard, if not impossible to assemble a “volunteer army” for social change, and there are few signs that the campaign fully understood the need for infrastructure and a deeply supported organizing structure. Our union gets lots of calls from the campaign to act, but aside from the hectoring, little real support from the campaign itself. A campaign of any kind faces a high mountain to climb when it is asking organizations and supporters to put aside their daily work in order to pick up the banner for something else, especially when the call involves something different week after week. This may not have been a winning strategy for the Poor Peoples’ Campaign. Rev. Barber and his Moral Mondays efforts in North Carolina were galvanizing while he was head of the state NAACP there, and he has clearly become an important voice for change and a tireless advocate for the poor. The NAACP is not listed as a partner in this campaign though, which also speaks to some unresolved internal issues. One fears that the campaign’s embrace of the national press and the speaker’s bureau approach rather than real organizational building and support may have inadvertently made this effort more about building Barber’s “brand,” than building something real on the ground. Martin Luther King, Jr. was a master in the pulpit, but he led a deeply rooted organizational base and led a real movement. Making the call isn’t enough, and never is a substitute for real action and work. We need a real poor peoples’ campaign, so let’s hope the seeds are being sown now to build for more and more in the future. Please enjoy Lori McKenna’s People Get Old. Ice Cream and Cigarettes by Million Miles. This entry was posted in ACORN, Citizen Wealth, Financial Justice and tagged arkansas, Poor Peoples Campaign by Wade. Bookmark the permalink.